The Beauty of Life: Fabulous New Haircolor, Thanks to Christie at Kim Vo Salon! Fabulous New Haircolor, Thanks to Christie at Kim Vo Salon! While I was in Vegas a couple weeks ago, I had the opportunity to visit the Kim Vo Salon at the Mirage. Yes, the Kim Vo of Shear Genius judging fame! (Not to mention he's the genius behind basically every celebrity's fabulous color.) 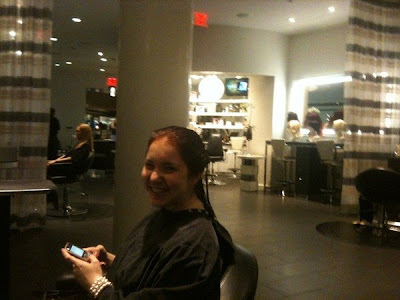 In any case, Kim and I have been corresponding on Twitter, and he invited me into the salon for a little fun. While Kim wasn't there that day (boo! ), he left me in great hands with Christie. I sat down in Christie's chair, said I was thinking about going redder, and immediately she knew exactly what to do. She wanted to take it in a bit more purplish red of a direction, which at first really scared me -- I thought back to my Garnier color-in-a-box days -- but she assured me it would look natural. I settled into the chair while she mixed up my color, and as soon as I saw it on my hair (even while it was settling) -- WOW! I could just tell that magic was going to be made. After about 25 minutes (Christie really wanted the color to be deep and rich), I was rinsed out and blown dry. Oh. My. God. I feel that my hair is EXACTLY the shade I've been searching for all these years. It's somehow auburn, deep brown and bright red all at the same time -- and it is RIGHT. Not to mention Christie was the sweetest stylist ever -- and we discovered we're both originally from Cleveland and share the same last name! Small world, huh? Thanks so much to Kim Vo for offering me the chance to check out his Vegas salon! You can follow him on Twitter here.